It’s a little hard to explain this experience called YCC. After 10 days of spending literally every waking moment with the folks in that picture, you would think that I would be ready to say, “Sayonara,, baby.” Instead, my heart is heavy as I head home. Don’t get me wrong, I’ll be ecstatic to see my family when I walk in the door. But those folks? They are the cream of the crop. They are intelligent and sincere. They are passionate about what they do. They strive to better the beef industry each and every day. The drive they possess rubs off on you and I’m better today because I know them. Regardless of what segment of the beef industry we come from, we’ve spent the week learning from each other. We shared our perspectives. We didn’t always agree and that was good. We listened to each other and had honest discussions. The experiences we’ve had are second to none. Marin Kokes and the crew at National Cattlemen’s Beef Association put on a top-notch program. 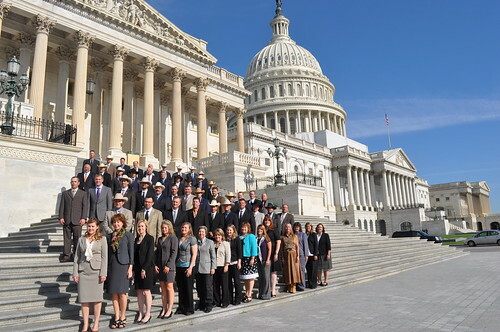 Whether it was touring the JBS Greely plant, seeing the opening bell at CBOT or converging on the Hill in Washington, D.C., learning through experience can not be duplicated. Many members of this trip had never had those opportunities before, and might not have the chance again. It’s safe to say this is a once-in-a-lifetime event. And there’s the cowboys. There’s nothing like being a lady when there is a cowboy around. He opens doors for you. He says, “Yes, ma’am.” He carries your bags. He treats you to cab rides and drinks. Multiply that times 43 and that’s what it has been like for the 16 women on this trip. There’s a reason that we watched women swoon as our cowboy friends walked past them on the city street. Friends who are former YCCers told me that the experience was like none other. And they were right. It’s the people, the learning opportunities, the industry relationships – all crammed into 10 days. So while I’m in full-on exhaustion mode, I still wouldn’t trade this opportunity for anything. Happy trails, YCC ’12. Until we meet again.